A graphic layout can be a great way to make your resume stand out when applying for creative positions. Employers hiring for jobs involving visual communication or design may look for applicants who present their qualifications in a stylized format. This approach to resume design is not always recommended, especially if you are applying for a more conventional job. In the right professional context, graphic resume templates can make a memorable first impression. If the position you are applying for emphasizes an ability to use design to get ideas across, a graphical resume can demonstrate your methods. You may want to think twice if you are seeking a job that emphasizes hard skills other than design. We provide some guidelines on how to determine the level of creativity or formality an employer expects and ways to align your resume design with their expectations while still standing out. Why Use Graphic Resume Templates? An entry level resume for an art or design position might benefit from some well-chosen graphics. Entry-level candidates in other fields should consider whether graphics could contribute toward or detract from their professional presentation. 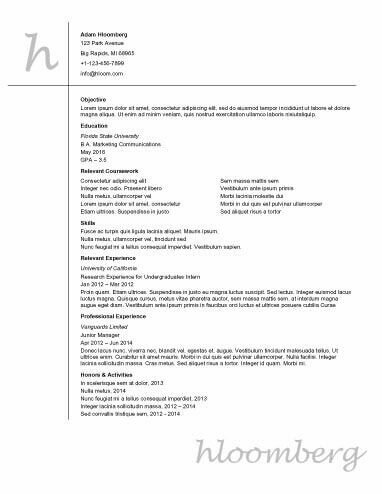 Browse our selection of entry-level resume templates to see what resumes on this level typically look like. Once you have a sense of content and structure, you can start thinking about style. Creative professionals should be aware of attitudes toward graphic resumes in their industry. Applicants may want to consider showcasing their accomplishments and experience using creative graphic resume templates or infographic templates. Depending on your field, you might also want to present design work by using a portfolio resume template. Some of the most creative resume templates have graphical elements. You can find templates with visual touches all the way up to infographic-style resumes. As most resumes do not have illustrations, graphic resume templates tend to be more creative than other styles. Depending on the position you are seeking, creative templates may draw the right kind of attention to your resume. Even though most resumes primarily consist of formatted text, some of the most popular styles do feature images or illustrations. Browse our popular resume templates to find a style suitable for presenting your qualifications. Comparing these templates may also help you determine the role of graphics on your resume and where you would like to add visual elements. You may want to achieve a coherent look rather than adding graphical features to your resume at random. Our modern graphic resume templates demonstrate several ways to make visual elements contribute to an up-to-date style. These tested eye-catching layouts can either serve as the basis for your resume or inspiration for creating a more graphical design. Most resume content is fairly standardized, regardless of the resume template you choose or the graphics you plan to use. Here is an overview of the information that typically goes in each major resume section. Summary Statement: Emphasize your best qualifications for a position by starting your resume off with a summary statement. This series of phrases should correspond to the job description of the position for which you are applying and indicate that you might be the right fit. Objective Statement: If you are early in your career or changing fields, your resume might benefit from an objective statement. This declaration of your purpose or intent in seeking employment can give an employer a sense of your reason for applying and your professional goals. Structure: The first entry in this section should be your current job or most recent employment. Then, go backward through time to describe previous positions. Role: Start each entry with your job title, the name and location of your employer, and the dates of your employment. Details: List a few responsibilities, accomplishments, or compelling metrics that support your ability to succeed in each entry. Academics: Provide details on all of your degrees, starting with your most recent or highest level of education. If a position requires a degree beyond a high school diploma, you do not need to provide details about your high school. Training: The education section of your resume is also a perfect place to bring up professional credentials and include training, certifications, licenses, or professional memberships. Assembling a visually compelling resume can be a challenge even with our library of graphic resume templates. If you would like to simply enter information directly into the template of your choice and have a polished resume generated automatically, you should consider using a resume builder. This tool allows you to follow several simple steps to go from an idea about the kind of resume you would like to have to having a complete document that is ready to send out.